HARMONYWIZ is an advanced harmonic generator which can create multi-part harmony, all just from inputting a single musical line. 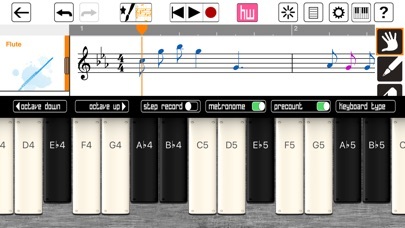 You can paint your music in or play it from a piano style keyboard. You compose it and HarmonyWiz will arrange it! After an arrangement is created, the app provides harmonic analysis and displays a notation system known as Figured Bass. Enter the Expert mode and you will have access to manage all the tracks in your arrangement with our editing tools. Select different preset sound ensembles or create your own. HarmonyWiz. Entertaining and fun for all ages, but also a valuable educational tool for music students and can be used for advanced editing by industry professionals. This release of HarmonyWiz features the Baroque style and some of Jordan’s personal variations on its classical foundation. The sounds in HarmonyWiz are from Jordan’s personal library. We also offer a great collection of additional sounds as In-App- purchases. One can also enjoy just playing the great sounds of HarmonyWiz from the onboard or midi keyboard • HarmonyWiz offers a unique, assisted composition engine • Place guide notes in any track including the melody or bass lines • Force chords to have certain degrees or inversions • Choose from five different harmonic styles: Baroque, Contemporary, Smooth, Free, And Open • Non-harmonic tones such as passing notes or suspension notes • Built in multi-touch keyboards in both chromatic layout and harmonic • Supports the use of accidentals • Supports simple and compound meters • Supports major and minor keys • Displays harmonic rhythm • Multiple undo and redo • MIDI in and MIDI out support • AudioBus support • AudioShare support • Ten built-in instruments including orchestral and electronic sounds • More instrument packs available for in-app purchase • SoundCloud sharing IMAGINARY PRAISE FOR HARMONYWIZ: “I wrote my first composition at age four. Too bad I didn’t have HarmonyWiz so that I could’ve had an even earlier start.” Wolfgang Amadeus Mozart “HarmonyWiz is a great tool for composers like myself. If I had HarmonyWiz when I was a young man, I could have composed a symphony every day.” Ludwig van Beethoven REAL PRAISE FOR HARMONYWIZ: “HarmonyWiz is such a fun and awesome compositional tool! Perfect for helping any musician unlock and explore endless creative harmonic possibilities. It’s practically like having your own digital writing partner at your fingertips. The only problem for Jordan, is that if he keeps this up, he may just “tech” himself right out of a job! John Petrucci (Guitarist of Dream Theater) ABOUT THE CREATORS: Jordan Rudess explains, I always felt that a composer’s thought process would be fascinating to capture in code. I’ve wanted to do an app like this for a long time and, upon meeting developer, Ruben Zilibowitz, it finally has become possible. Ruben has spent years studying classical music texts such as Schoenberg's Theory of Harmony. He started by writing out four-part phrases by hand. Eventually, he was able to translate this process into computer code that could generate natural musical phrases. Through hours of sitting at the piano, studying my own compositional method, to Ruben’s tireless coding we believe we have achieved something truly unique and inspiring. If you have any feedback/questions concerning HarmonyWiz, please send them to us at support@harmonywiz.com. We will get back to you promptly. Note: We cannot respond directly on the App Store review page. I love how easy this app is to use and I’m constantly inspired by the suggestions it makes! Really wanted this app for my music process. I have an iPad Pro and Wizdom Music hadn’t updated this app for awhile. I wrote an email requesting my wishes. They replied immediately and soon after actually updated for the recent iOS. When I played with the customizations, it was possible for me to integrate my the song into composition. Such a cool app. Thank you! Good app no longer working. On an iPad Air, not sure if it’s a 2 or not but the latest HarmonyWiz does not work. Specifically, the splash screen opens upon start and then crashes back to the iOS 11.2 interface. The program was an entertaining augmentation in scoring and was fun to use. Not quite a five star app but useful and fun to work with. Hopefully it will be troubleshot and fixed. I am experienced with notation programs. This user interface is the worst that I have seen. The tutorial that comes with the app does not work. The tutorial on You Tube is terrible. The Help is worthloess. Do not waste your money. Fun app even for semi-pro and pro musicians. The more editing post art, the better! Part of it okay, but you can't add any sharp or flat notes. 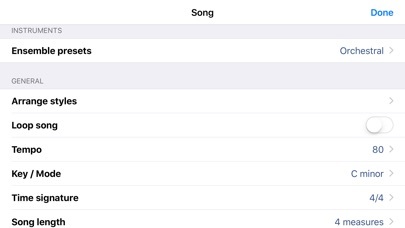 Also you can't add any dynamics (soft or loud). Not worth getting if you ask me. This is a great app.! Lots of fun for an old school musician. Jordan is a musical marvel and tech guru! You will enjoy! 1. 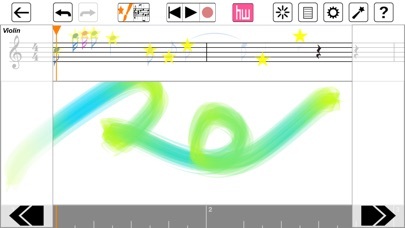 At the top left, click on the score icon ... next to the brush-with-a-star icon ... this turns on the note writing feature. 2. Go to preferences ... the usual icon ... and turn on "expert" mode. 3. On the right side of the screen, the hand is selected ... this moves the page around ... click on the pen tool: the note icons below it will light up. 4. 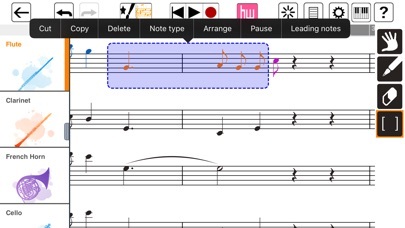 Now you can select a note type and touch the screen to place one on the score. 5. Make a few bars of melody and click the HW arranger. Don't worry about precise notation, the arranger will clean it up. Play it. 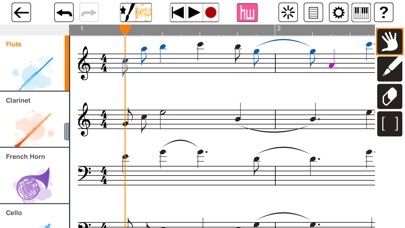 Press the star button to the right of HW and "clear arrangement". Refine and repeat. Violins and cellos are a bit silly in these times ... a guitar, synth and bass combo would be welcome - and some of the expert buttons crash the app. Otherwise, it's an interesting little gadget.